Founder, David Vitale, started off with a simple vision; create a uniquely Australian whisky we can offer the world with pride. Born and bred in Melbourne, he was inspired to create a spirit that reflects his home town – from its culture to it's famed 'four seasons in a day' temperature swings. It is a city surrounded by some of Australia's leading wine regions – all within a day's drive – and is regarded as the microbrewing capital of Australia. It seems obvious now that all the ingredients for a modern Australian whisky were close by. But, in 2007, when he first started, the idea of an approachable, affordable Australian whisky – served neat or as a cocktail with food – was a big leap of faith. While Australia had a well-established small-scale ultra-premium whisky scene, David pioneered an affordable, approachable and distinctly Australian whisky. The result is STARWARD. A modern Australian whisky, elementally matured for three "Melbourne years" in Australian wine barrels, that pushes the boundaries of what whisky can be. 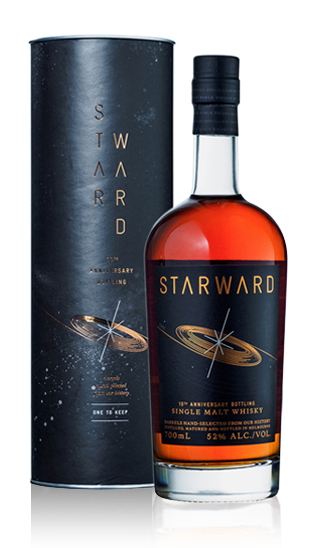 At STARWARD we use Apera (Australian sherry style) barrels to age the Solera expression. The average age of wood is in excess of 20 years of age and some barrels are over 55 years of age. We hand select these barrels that are painstainkingly re-coopered, re-toasted and re-sized for aging our spirit extracting dried fruit, spice and more sweetness. Our barley is 100% Australian and adds to the provenance of the whisky. We have worked with our maltster and use a bespoke Australian malted barley to suit our requirements - a balanced cereal note providing a full mouthfeel. The result? The palate is filled with rich, toasty caramel, creme brulee, more fruit, pepper, sandalwood, nutmeg and marzipan. A full, sweet, juicy mouthfeel, with a youthful, spicy, dry finish. Matured solely in Australian red wine barrels (Shiraz, Cabernet Sauvignon, Pinot), this single malt represents a unique integration of our local barley, climate and innovative approach to producing whisky. The 10th Anniversary limited edition bottling is a celebratory whisky; a blend of barrels across STARWARD's history to celebrate their journey as a whisky Distillery so far. A New World integration of 28 carefully curated barrels; from dark fruit and spice of PX and Apera, to the red fruit and tannin of Wine Casks, and the softness of second fill Apera Casks. A limited release production of only 28 barrels.